Who doesn’t know or hasn’t heard of that timeless tale of star-crossed lovers in Verona, Italy whose love was not meant to be? Since Shakespeare penned their story in the 1500s, the basic plot has been replicated again and again, not only in literature but in films as well. I read various versions of Romeo and Juliet since high school, and the effect on me was still the same: a deep sympathy for the lovers and an accompanying yearning to experience that same idealized, endless love (crap). The fountain at Piazza del’Erbe. Objectively speaking, what’s so romantic about a 13-year-old girl falling for a 17-year-old foolish boy who keeps on falling in love with whoever catches his fancy? In fact, at the time that Romeo and Juliet met, Romeo had been depressed about his unrequited love for another girl. And yet, for some reason, Shakespeare has managed to touch the core of readers’ emotion. Despite everything that tells us that this was a stupid tale full of needless violence and unrealistic love affairs, we’re still drawn to the tragedy like moth to flame. And at the end of the book or the movie, we still weep with the image of Romeo and Juliet dying in each other’s arms, remembering perhaps, our own tales of woe when it comes to love. 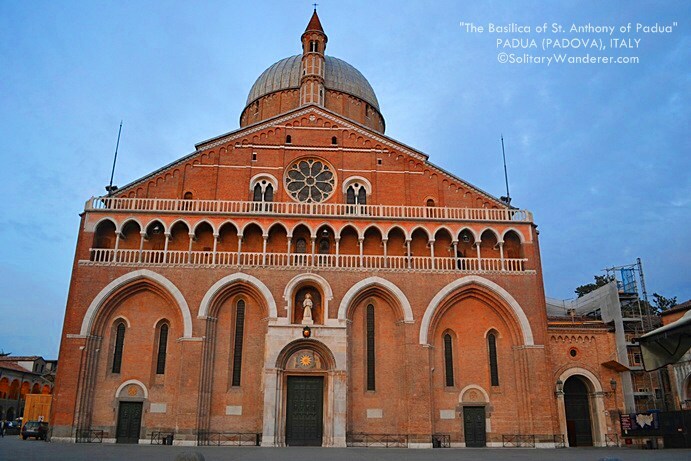 The Gothic Sant’Anastasia church dating back to the 1400s. BUT this is not a treatise on the story of Romeo and Juliet. This is about my visit to Verona, Italy, the scene of so many of Shakespeare’s plays. 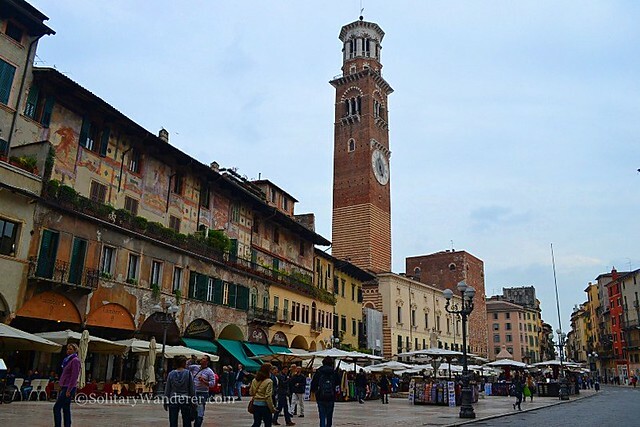 I was almost at the end of my 70-day solo backpacking trip in Europe when I went to Verona. My primary reason was simple; the cheapest flight I could get from Italy to Belgium leaves from there. 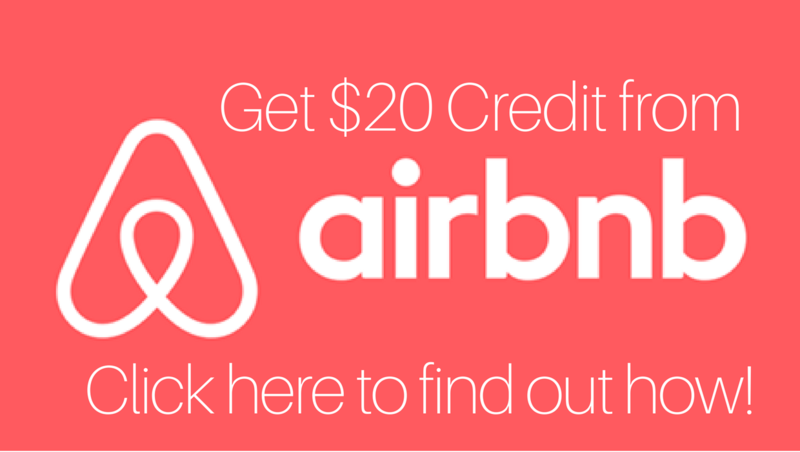 So, Shakespeare + historical buildings + cheapest flight (only 30 euros!) = Verona. It was certainly a no-brainer! I only had one day, but at least I managed to see a bit of this beautiful city. One of the things that I really liked in my brief stay in Verona was the fact that my hostel was very centrally located. 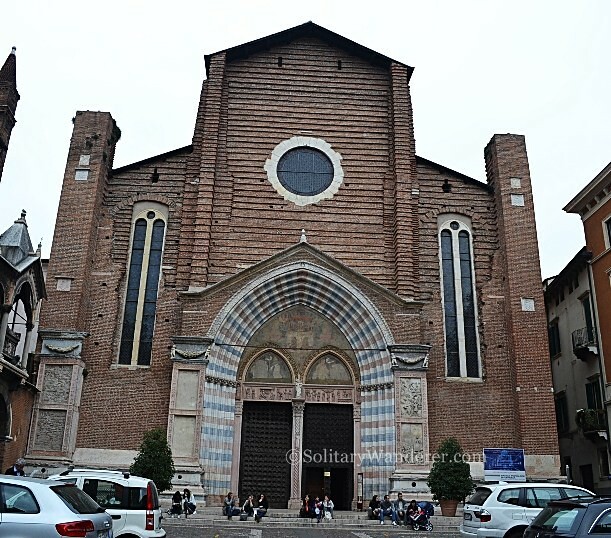 I booked it through Roomorama (more on this in another post), and it was walking distance to the old city center of Verona where most must-see sites are located. After I had gotten my key from my Roomorama host and left my backpack, I immediately set off on foot to discover the sights in Verona. My first stop: Casa di Giulietta. The entrance to Casa di Giulietta and Juliet’s Wall. Juliet’s House is the destination of lovers and those who are wishing to have lovers. Located in the middle of a busy street leading to Piazza del’Erbe, you will only notice it for the fact that the walls of the alley leading to the house is full of graffiti. If you take a second look, though, the “art” that “decorates” the wall are actually names of people who are hoping to have a love as everlasting as the tragic couple’s. 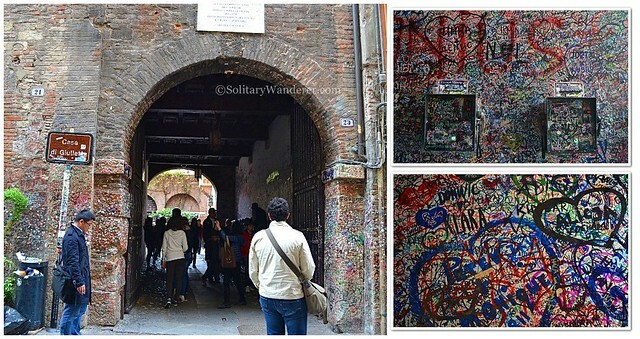 Known as Juliet’s Wall, you can find hundreds of bubble gums stuck here where people used to stick their love letters (see the movie Letters to Juliet). Beyond Juliet’s Wall is the house of the Capulets itself, although it’s said that they really never lived there. If you’re expecting something spectacular, you’ll be greatly disappointed. There’s nothing there but a small courtyard facing the famous balcony and a statue of Juliet. 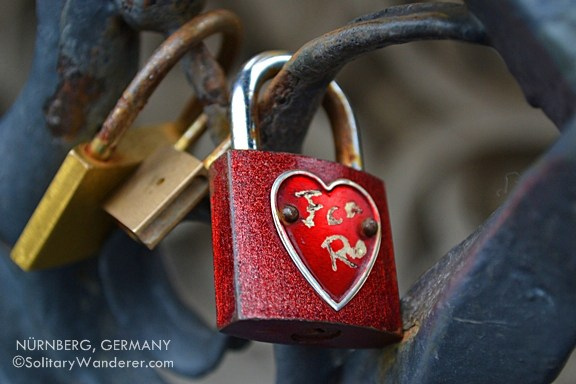 There are hundreds of love padlocks too. Juliet’s statue in front of the house (note the balcony). There’s no shortage of people around the statue waiting for their turn to fondle Juliet’s right breast. It’s supposed to bring good luck (like touching the cross in Charles Bridge in Prague, or touching the donkey’s front leg in Bremen, both of which I certainly did), but keeping in mind that Shakespeare’s heroine was supposed to be only 13 years old, I managed to refrain from doing so. The ancient Piazza del’Erbe which used to be a Roman forum. If you keep walking from Juliet’s House, you will end up in Piazza del’Erbe, a historical square that was once a Roman forum. It’s the center of the old city and it’s usually full of people just walking around or sitting on the benches eating gelato. The center of the square is taken up by numerous souvenir stalls; in the olden days, farmers came here to sell their vegetables. Note the old buildings beside the fountain (first photo); the walls are full of paintings! It must be so great to live in a country where your cultural heritage is valued and preserved. The 3rd largest Roman amphitheater in Italy. While Verona is best known for Romeo and Juliet, it’s also culturally and historically significant. It has managed to restore a lot of ancient structures—including the third largest Roman amphitheater in Italy—that made it deserving of its UNESCO World Heritage Site status. 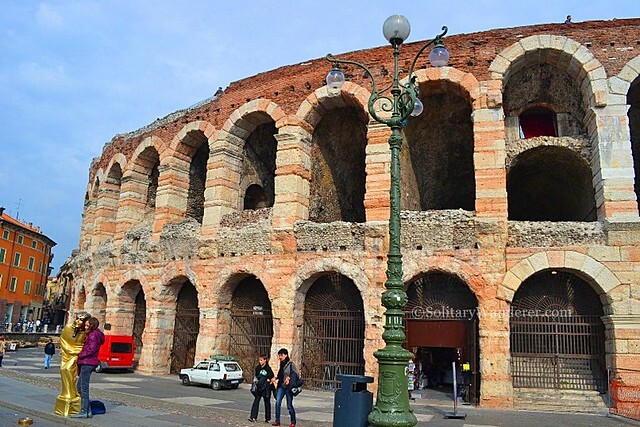 While not as big as the Colosseum in Rome, Verona’s arena is still impressive. Built in the first century AD (yes, it is that old), it’s still well maintained and retains its original structure. When you’re there during the summer season (here’s what to pack for your Italy trip), it’s open for concerts or operas. What would it feel like to sit inside that huge amphitheater listening to great songs while imagining how it was like before when there were gladiators fighting for their lives? 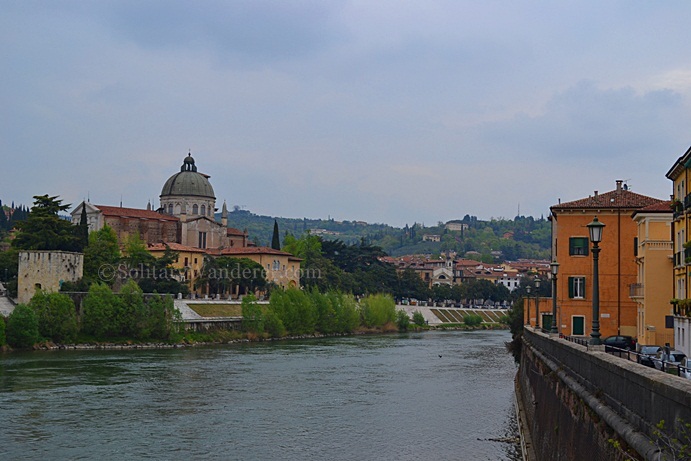 There are actually so much more to see in Verona. However, it rained soon in the afternoon, and without an umbrella, I couldn’t go on walking around. I was also anxious about my interview with CBS News Travel editor Peter Greenberg that night, so I soon went back to my bed-and-breakfast, wishing as I passed by Juliet’s House again, that I could find what she herself had found—everlasting love. Even though I know it’s crap. How about you? Do you believe that there is such a love as what Juliet had with her Romeo? Amazing photos! I’m happy to hear that you had such a great trip, and that you were able to see so many historical buildings. The architecture in Italy has always fascinated me, and the Casa di Giulietta looks like an amazing place to visit! Too bad it rained! When you go back, Castelvecchio and Piazzale Castel San Pietro has some of the best views and most picture perfect spots in all of Verona! @ Randz: Budget depends on where you’ll be coming from! From Rome it will be around 50+ euros. Definitely worth going there if you’re already based in Italy. 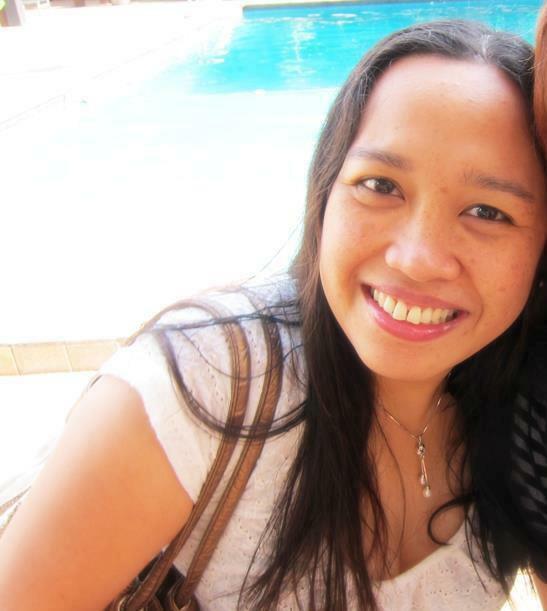 btw, how much would be the budget if going there…i really need to have some pics with my wifey. I love Italy but I am bad luck that never go there, but soon I will travel. Its a great destination to visit..Very interesting the history..I learn a lot on it..Thanks for sharing..
@ Debbie: You should go there during summer, then, when the amphitheater’s open and when they hold concerts. It must be very nice! @ Arvin: No problem, thanks for dropping by my blog! thanks sa pag share sa pictures.. Sounds like a wonderful city to visit. After all the Shakespeare I studied in high school it would be great to visit Juliet’s house. I want to go there soon!! I loved Verona when I went there. The Town square is very pretty. I spent a wonderful afternoon there eating gelato. Happy times! I love this post. Looking forward to visit one day here. @ Mary: I’m not a hopeless romantic, but it’s easy not to get carried away when you’re in Juliet’s House in Verona. All those hearts in that small courtyard LOL And yeah, the city is still best known for that love story. I love, love the movie Letters to Juliet! After watching the movie, I knew I needed to got to that part of Italy. How lucky for you to have had the chance to visit, Aleah. It does look fascinating! I wasn’t even aware of everything else Verona had to offer. I like to believe the notion of Juliet’s love exists but it’s far too idealistic especially in today’s modern times. 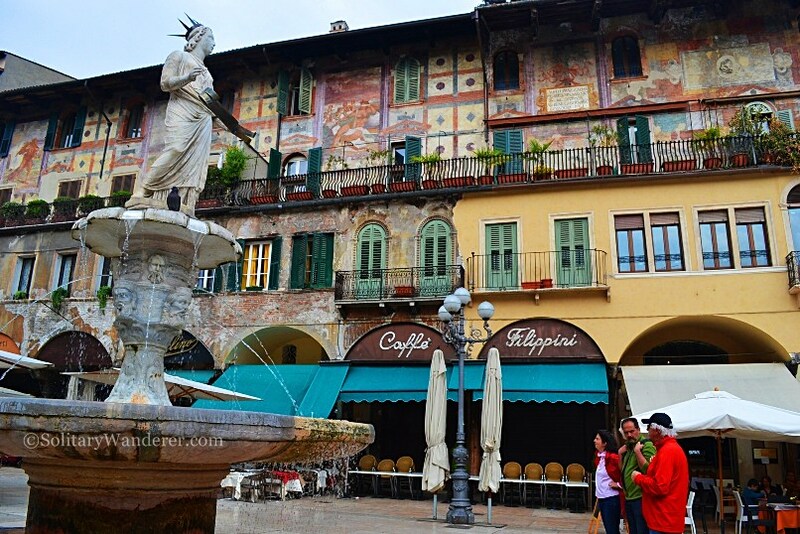 I would love to visit Verona for all of the romance, beauty and history. I’d be right there with all the tourists at Juliet’s Wall. I didn’t buy the crappy values of love in Romeo & Juliet, but Verona certainly seems interesting. But what a small balcony! I guess 13 yo in ancient Italy must have been small-sized. @ Lisa: Yeah, there’s certainly a lot more to see there. But it’s a quieter and smaller city than say, Firenze or Rome–perfect to take a breather in. Verona is a city that I would love to visit for the Romeo and Juliet connection. (I loved the Letters to Juliet movie too.). Nice to know there’s more to see there too!